As the war in Ukraine’s East enters its fourth year, with no prospect for peace; the people leaving near the frontline of the protracted conflict remain at its mercy. Natasha Titova holds her hands up and counts her fingers. “Seven times,” she shouts, that her yard was hit by shelling. She thanks God with a sign of the cross that her house was never hit and neither her beloved animals. The 55-year-old farmer lives in Nevelskoye, a small village in the Donetsk region, only 20 kilometers from the frontline where the war between Ukrainian forces and Russia backed separatists has been raging for four years. The village is under government control, but its inhabitants have long been forgotten by Kiyv. Among the rubble and piles of tin sheets, Nevelskoye seems desolate; a post-apocalyptic world where only the elderly and bravest have survived. The village is accessible only by a potholed dirt road, after passing through four military checkpoints. “Life here is very hard. Our car broke down so there’s no way toget anywhere to get bread or anything,” Natasha says. She will be eligible for it when she turns 60. “I have two grandchildren, and when they come to visit they say ‘ba, ba’, because they can hear the bombing and shelling,” she adds. Natasha’s children and grandchildren now live further west in Donetsk and visit her once a month. Her son used to live across the road until his house was destroyed by shelling. By the same token, the blue gates shielding Natasha’s home are riddled with bullet holes, as are much of the houses in the neighbourhood. Some homes have been completed destroyed by shelling, others partially damaged and rebuilt. Then, there are the homes that were abandoned by those who fled to safety or to find work elsewhere. “We lost our jobs in 2014 when the war started, and we haven’t worked since then,” Natasha says. 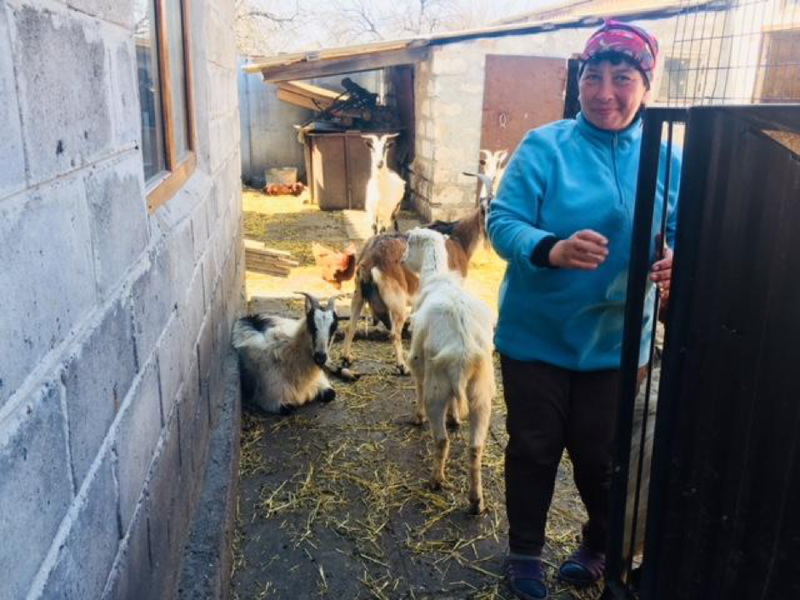 She was a veterinary nurse at a local animal clinic before the conflict began and boasts about graduating from vet school with honours in Russia more than 30 years ago. That’s also where she met her husband Vladmir, 58. She keeps herself busy by shearing her sheep and harvesting crops, mainly potatoes and tomatoes, that grow in the fertile soil of her garden. The dozen goats in her yard provide milk and the chicken, the eggs. People in Nevelskoye are self-sustainable, living off the land and farming for their sustenance. It’s more by necessity than by choice since all businesses and shops have packed up and closed. Every day, around midday, the people of the village gather together to receive their bread from pastor Vasiliy, who heads a church and a bakery in nearby Myrnograd. Natasha Minalova, 61, has lived in Nevelskoye for almost 30 years. “It’s horrible, that’s the only word to describe it,” she says, referring to living near the frontline. She’s also sleep deprived. The night before, the shelling had been particularly intense. “We get up, we have breakfast every morning and we listen to what the situation is with the shelling, and then we carry on. We feed our animals, maintain our gardens and we pray that no one gets hurt,” Natasha says. Not long after the conflict began, the village’s electricity and water were cut off for several months, according to locals. Every few days, people would walk five kilometres to the river and fill buckets with water to bring back to their homes. Nevelskoye is not only the target of snipers and shelling, but of looters too. Natasha’s home was ransacked more than once, although she concedes she didn’t have much to begin with. “Only the walls are left, everything has been taken away. They took everything, the dishes and the carpet,” she says. Natasha moved to the village in 1992 to work at the local dairy farm. At its pinnacle, the collective farm had more than 1000 cows, Natasha says, beaming with pride. Today, it lays idle and dilapidated, where stray dogs and other animals take shelter from shelling. Most of the inhabitants worked there in some capacity or were involved with the collective. Other locals all have similar stories. They had moved to Nevelskoye for work or were born there. Most lost their jobs after the war began, and their children fled to safer towns and settlements in Donetsk or beyond. The elderly stayed behind for lack of prospects elsewhere, determined not to forfeit their land. Despite the shelling and looting, former vet nurse Natasha Titova is adamant she wouldn’t live anywhere else. “I was born here, this is my land. I buried my parents here. I love this town so much, it gives me goose bumps just thinking about it,” she says. The war in Ukraine’s Eastern Donbas region began in 2014 in the aftermath of the Euromaidan Revolution and Russia’s annexation of Crimea. More than 10,000 people have already died in the conflict, including 3,000 civilians, according to OHCHR. Despite multiple attempts at a ceasefire with the Minsk Agreements, hostilities between Ukrainian forces and Russia-backed separatists have continued with frequent shelling of government and civilian infrastructure, while some villages like Nevelskoye remain caught in the middle.